MONTREAL — Eleider Alvarez posted a workmanlike unanimous decision over Poland's Norbert Dabrowski on Saturday to set the table for his Feb. 24 fight with former world champion Lucian Bute. 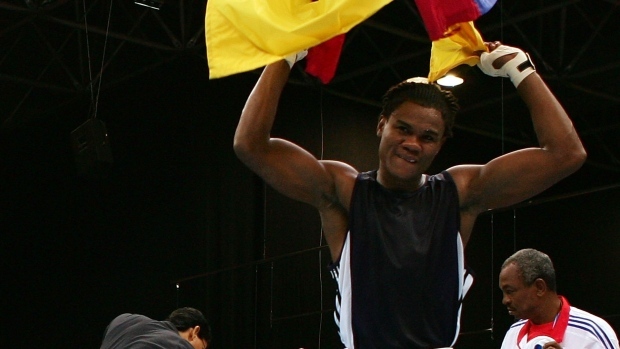 Alvarez (21-0), a Colombia native based in Montreal, won on all three judges cards by 97-93, 98-92 and 99-91 scores. He retained his position as the top-ranked light heavyweight contender in the World Boxing Council. "Eleider is a technician," his coach Marc Ramsay said. "You'll never see him put on a show like Arturo Gatti. "It was a good technical fight." Dabrowski (19-6-1) suffered his fourth loss in his last seven bouts, but caught Alvarez with some good shots in the late rounds and opened up a cut that needed three stitches to close. Ramsay said the injury shouldn't affect his training for Bute, the former International Boxing Federation super-middleweight champion. Alvarez hopes a win over Bute will lead to a title shot against another Montreal fighter, WBC champ Adonis Stevenson.